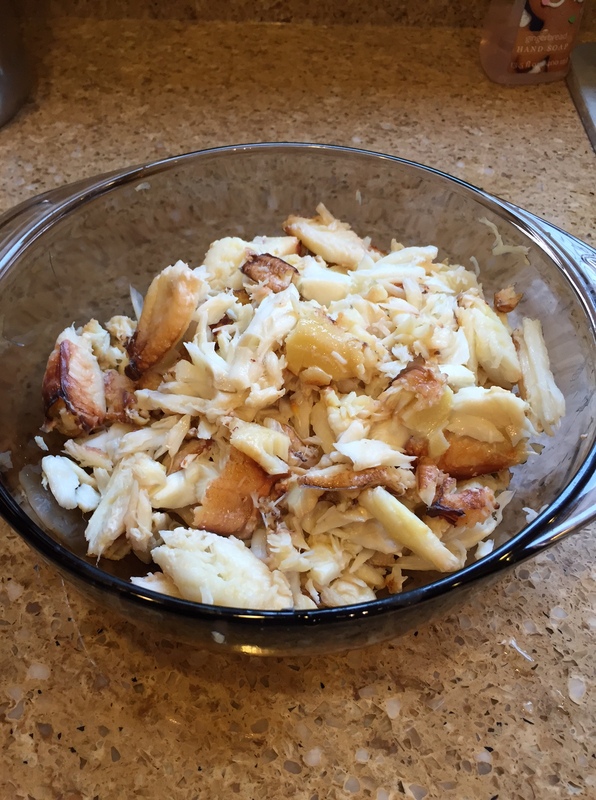 Recently, friends gave us some crab they had caught on a recent crabbing expedition. 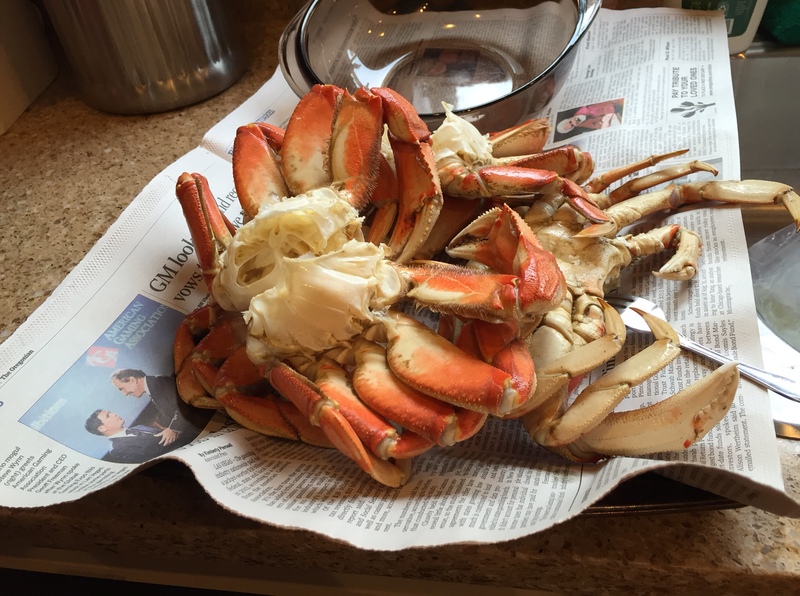 They shared 4 lovely Dungeness Crabs with us. What a treat! Living in the Pacific Northwest provides us with an opportunity to enjoy seafood on a regular basis. However, to buy crab is quite expensive, so it’s a wonderful gift when someone shares. We haven’t been crabbing for a while, but enjoy going when we get an opportunity. 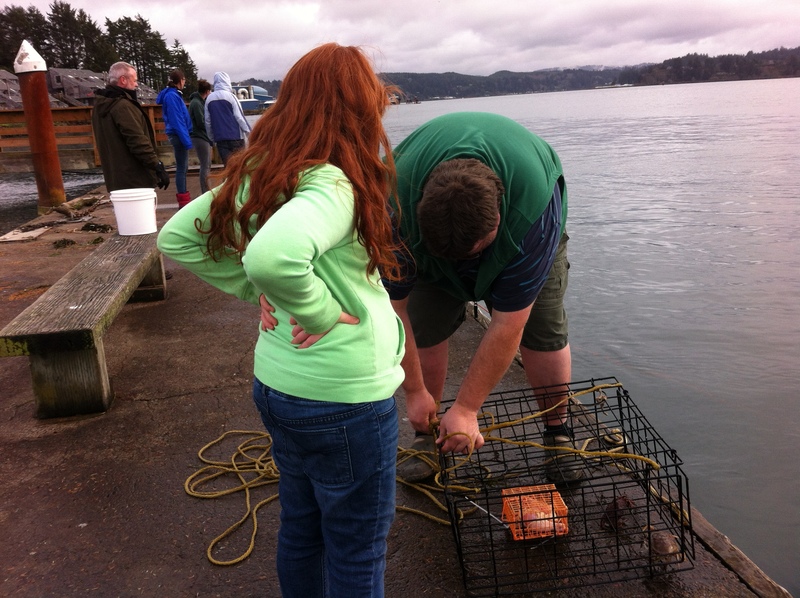 Rob likes to use the square cage traps because it’s harder for the crabs to escape. We do use the round ones as well. The bait we have the most luck with is chicken. Rob buys the cheapest chicken he can find and puts it into the inner bait box. If he has time to let it sit out in the hot sun, it works even better. The crabs seem to love chicken that is starting to turn bad. He has also used old fish carcasses that are sold for bait, but for us, chicken works the best. After the traps are baited, they are tied to the railing of the dock and thrown into the water. They are left down in the water for 15 minutes, if you are crabbing with kids who can’t wait, and much longer if you aren’t. If you have the location to do it, they can be left in all night long, but we don’t usually do that. When it’s time to pull them out, the round ones must be pulled quickly or the crabs escape. The square traps can be pulled a little slower, if need be. If the crabbing is any good at all, there will be a trap full of little and big crabs. All of the little ones usually scurry off the dock and back into the water. The big ones are grabbed, carefully, and measured with a crab measuring stick. If a crab meets the length criteria, and is a male, it is a keeper and is placed into a bucket, and the trap is re-baited and the process starts again. Crabbing is usually best when the tide is changing. When we are finished for the day, the crabs need to be cooked. We throw the live crabs into a pot of boiling water that has been salted with rock salt for 20 minutes. After removing them, they are cleaned, and then put on ice immediately. Then they are ready for cracking and eating, or sharing. Cracking takes a while. It took about 1-1/2 hours to crack out 4 crabs, using a fork, and I got about 4 cups of crab meat. We’ve spent many an afternoon at a picnic table in a campsite, cracking crab as a group when many have been caught, especially if the catch was big! It’s just too much for any 1 person to do alone. If a crab had a claw that could not be conquered with a fork, I used a small glass with a super heavy base and smashed it lightly to crack the shell, then picked the meat out. We ate about 2 cups for dinner, and I froze the rest. It won’t be as nice after freezing, but I don’t want to waste any. Crab is rich and we can’t eat huge quantities at one sitting. The way we enjoy crab the most is in Crab Louis salad. We make a base of lettuce and greens, and put cheese, hardboiled eggs, tomatoes, or whatever toppings we have on, and then cover it with the cracked crab. We like Thousand Island dressing with it. 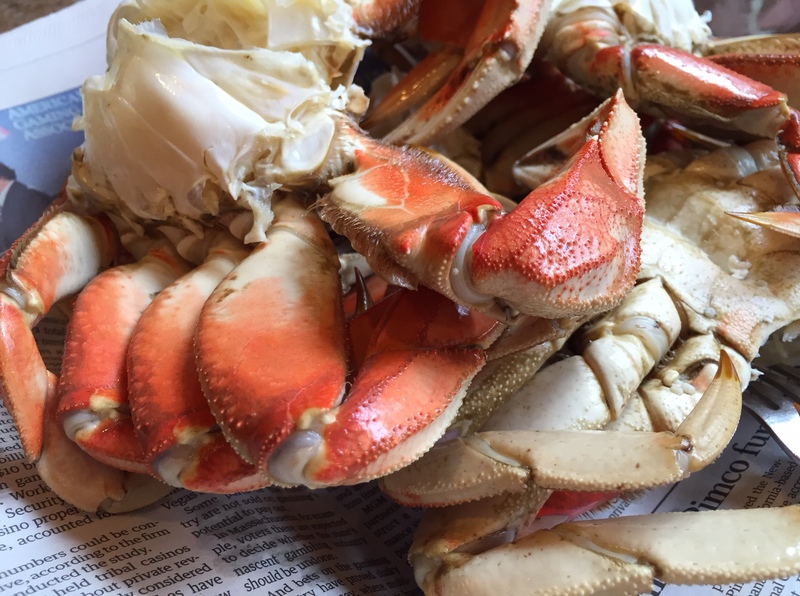 That way we get to experience the flavor and enjoy every succulent bite of our hard-earned crab!